” In 1946, the full house of the SGPC passed a resolution for an Independent & Sovereign Sikh State which would encompass the area South of the river Chenab to the Jamuna in North. This resolution was brought forward by S. Basant Singh Kukkar(Member SGPC), which was unanimously passed by the entire House. It was the duty of the British Govt. the home of the Parliamentary form of government to honour this resolution. However most of our Sikh leaders of that time were so muddled that they too could not inforce this resolution. – S. Simranjit Singh Mann, President – Shiromani Akali Dal Amritsar. 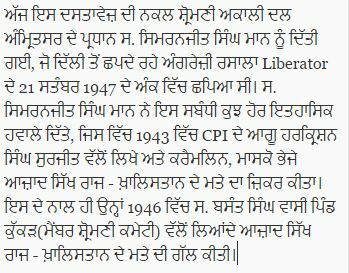 We are greatful to Mr. Gurpreet Singh Sahota for ferreting out this precious document from the British National archives.